The clock app shows the system time and also user location. However when you boot your phone for the first time, it turns out that the default system time is UTC time. Thereby if the user location is anything other than UTC, then there is a discrepancy between the time and user location shown leading to a confusing situation. 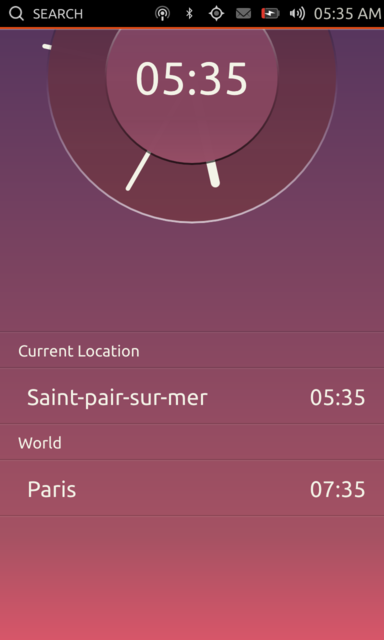 In the screenshot attached, the user location detected is Saint-pair-sur-mer located in France and the time shown is 05:35 while the actual time in Paris was 07:35. The wrong system time is not necessarily clock app's fault since it merely shows the system time and does not have permission to change it. The wrong system time issue has been reported in bug 1426354. That said, it would be best to detect this discrepancy and perhaps show a dialog informing the user about the incorrect system time and directing them to the system settings app where they can set the correct system time. This requires design input on how to proceed. I believe this bug still exists in the clock app reboot as well. Adding ubuntu-ux to get design opinion. Thanks for reporting this bug. However this is not a bug since the clock app is programmed to follow your system time as seen in the indicator at the top of your screen. Your system time is currently set to UTC time and hence the clock app is also showing the incorrect time. If you change the system time through system settings and restart the clock app, you will see the correct time shown. At the moment, the clock app does not have the permission to set the system time and hence it shows the correct location but the incorrect time. Please confirm if this fixes your issue. It doesn't fix my issue, sorry if my description wasn't clear, in other words how showing 2 cities in the same TZ with different times is not a bug? I understood what you described. What I was trying to explain above is that the location service detected that you are in Saint Pair sur Mer and also knows that the time there should be the same timezone as paris. However it cannot perform this change since the clock app does not have the permission to change the system time to 07:35 AM. And hence it shows the correct location but the incorrect timezone. To fix this issue, you will have to set your timezone in the system setting outside the clock app so that the system time is adjusted to the Paris timezone. Then you will find that the clock app shows the correct location and timezone. On the other hand, if the clock app shows Saint Pair sur Mer and 07:35 AM, then you will have different time shown by the clock app and the system which is inconsistent. In version 2.0, the clock app will get the permission to set the system time. Until then, I can show a dialog informing the user that the system time has to be changed to match the current location time and that this can be done in the system settings. Isn't this bug now invalid as well? Similar to lp:1265145. This bug is still valid for Ubuntu Clock 3.5. I reproduced it on my BQ E4.5 phone.